1863 Junior Lecturer, Post Graduate Teacher, Trained Graduate Teacher, Physical Director, Librarian Posts in TMREIS: Telangana State (TS) Government accorded permission for the recruitment of 1863 Junior Lecturer (JL), Post Graduate Teacher (PGT), Trained Graduate Teacher (TGT), Physical Director (PD), Librarian posts in Telangana Minorities Residential Educational Institutions Society (TSWREIS) through Telangana Residential Educational Institutions Recruitment Board ((TREI-RB), Hyderabad, by Direct Recruitment through G.O.Ms.No. 57. 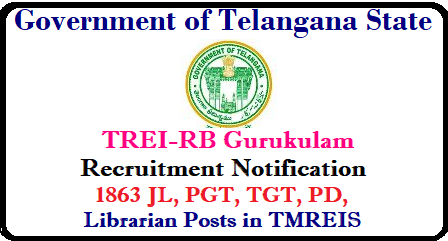 TREI-RB, Hyderabad shall issue TREI-RB Gurukulam Recruitment 2018 Notification and schedule for the recruitment of these 1163 posts in TMREIS vacancies soon.